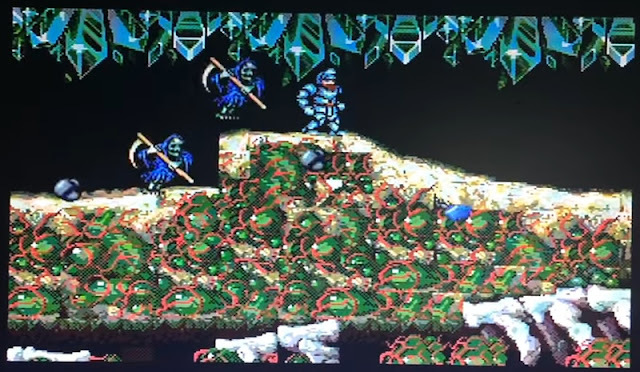 Indie Retro News: Daimakaimura - Ghouls 'N Ghosts Arcade port on the Atari STE? It's possible! Daimakaimura - Ghouls 'N Ghosts Arcade port on the Atari STE? It's possible! In 1988 Capcom released one of the finest Arcade games ever to grace the gaming scene, and that game was the incredible and most frustrating platformers Ghouls 'n Ghosts, which appeared on pretty much every system you could think of...Even the Atari ST. In fact today's mention is in regards to the Atari STE, as currently Anima is working on a more faithful Atari STE port of that classic game, which is being shown off in this very early work in progress glitchy video. According to the creator behind this port, he has said "any MC68000 equipped machine with a clock lower than 12mhz won't be able to get an arcade perfect port, however the reason to port this game to the Atari STE is to hope that the "best case" scenario in game is always less performance demanding than the "worst case"( Does that make sense to anyone? ;)). He also goes on to say the only good target for any CPS1 port is the Atari Falcon030, although that's more gameplay perfect than arcade perfect. As for an Amiga version, he did go on to say this below "
"Some notes about the Amiga: no, I don't see any reason why the Amiga would have an advantage against the Atari STE. The main problem here is indeed the amount of RAM for graphics/sprites and simply the speed of the CPU. There's no reason to think that the custom chipset of the Amiga will give it an edge over the Atari STE since the Amiga is stuck in its limited design."